Customer targeting certainly isn’t new, but the amount of shopper knowledge we have, and the cross-channel shopping journey are changing the game. With the advent of big data and AI, we can understand shopper behavior, predict what they’ll be most interested in, and deliver personalized messages wherever shoppers are on a level that’s never been possible before. This means that the opportunities for re-engaging your customer base are far greater than ever before, too. 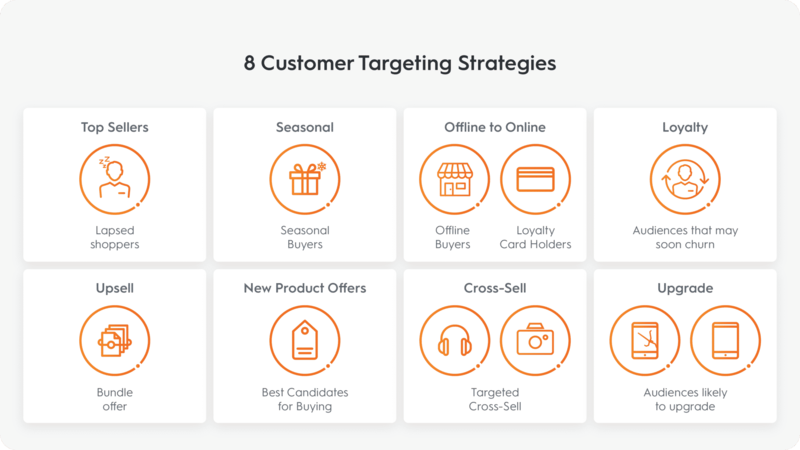 If you’re new to customer targeting, or looking to expand your efforts, here are 8 winning strategies for driving more revenue from your customers. At its most basic, customer targeting is the act of reaching out to a portion of your customer list to re-engage them and drive sales. Popular tactics for these campaigns include direct mail and email. Social media and digital ads provide newer avenues to connect with your customer base with more speed and precision. 20 years ago, customer targeting meant sending a direct mail piece to, say, your rewards club members, but now it’s a much more sophisticated effort. The variety of channels on which we can reach customers, and the increasingly detailed data that we can collect about them allows for much smarter customer targeting campaigns, yielding much better results. Low email response rates. Email open rates are around 20% and drive an average of 2% CTR. This means that 80% of the time, your email is ignored. Despite this, email is an effective re-engagement channel that delivers great ROI—but it’s best used in conjunction with other tactics. Low match rates. Many of the existing customer targeting solutions have insufficient or inaccurate identity graphs, and/or have issues successfully matching shoppers across devices. This leads to low match rates (how many of your CRM customers are identified online) and, therefore, a smaller audience to re-engage. Limited inventory reach. Solutions are often limited to the reach of their own network, but shoppers are spending significant amounts of their time online outside of places like social media and search engines. Reaching more shoppers in more places means adding additional solutions. Limited creative optimization. In some cases, there is a limited amount of creative formats available, or an inability to dynamically personalize creative, which can hurt ad engagement rates. Manual campaign set up. Some customer targeting solutions require heavy manual effort, from set up through analysis and optimization. This means that brands and retailers are spending inordinate amounts of time without a guarantee of improved results. Re-engage lapsed shoppers with top sellers. Reach lapsed customers using their last purchase date, and segment as you see fit (i.e. 6, 12, or 24 months). Bring them back to buy with ads featuring your top sellers. Connect with seasonal buyers. Reach your seasonal buyers when they’re most likely to convert using recurring campaigns. Boost customer engagement by targeting them with timely offers during seasonal sales periods. That customer who bought earrings for Valentine’s Day last year? Maybe a personalized ad showing a matching bracelet is what’ll get him to return to your site. Bring offline buyers, online. In many cases, a shopper’s first or only touchpoint is with your brick-and-mortar store. A customer targeting campaign can drive premium offline audiences online by offering personalized product recommendations and special promotional codes to entice them visit your website. Cross-sell based on a previous purchase. Don’t forget to also reach out to previous buyers with offers for other products they might be interested in, like a tablet or smart speaker for the customer who bought a laptop a few months ago. Communicate new products. Your frequent buyers are your best candidates for purchasing again. Be sure to hit this group with offers promoting new products. Upgrade to a newer/better product. Boost new product sales by connecting with customers who’ve purchased a product that now has a newer or better version available. Broad reach, beyond walled gardens. 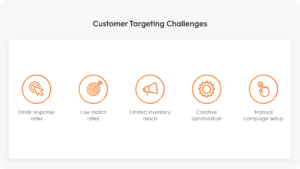 Some of today’s customer targeting solutions operate within walled gardens, which means that you’re only able to target shoppers within that garden. This limits your reach and leads to an incomplete view of shopper behavior. Supplement your efforts with a solution that can connect with shoppers beyond those gardens, wherever they are in their browsing journey. Strong match rates. Online customer targeting is only as good as the number of your customers that you can identify and match across devices. If you’re not seeing a match rate around 60% or better, you’re missing out. No data onboarding fees. Data onboarding can be costly, but there are plenty of solutions that don’t charge for this. Dynamic, personalized ads. Improve ad engagement with a solution that delivers ads that are personalized and dynamically optimized for each shopper. Have more marketing questions? Visit our Insights section for education, trends, and tips.